At Phoenix, our vision is to provide authenticated high-quality herbal medicine to practitioners within the UK and Europe. We strive for unprecedented quality that cannot be rivaled. Our herbs are grown using the DaoDi concept, whereby they are grown in the right place and harvested at the right time, resulting in herbs that come from authentic places of origin according to the classical text Shen Nong Gen Cao Jing the Divine Farmer’s Materia Medica. Our herbs are 100% traceable to the original source as we have secured a field to patient supply chain. Growing herbs with the DaoDi concept allows our customers to rest assured that our herbs are of the correct species and origin. What is the DaoDi concept? Chinese Herbal Medicine has always been deeply influenced by the natural resources and culture in China. The great geographic diversity of China provided ancient practitioners with abundant natural resources to explore, resulting in many items eventually becoming integrated into trade and Chinese medicine. Agriculture and trade gradually gave rise to unique developments such as the motion of DaoDi medicinal material which is a concept that associated authenticity and quality with specific regions and production practices. As a unique concept in Chinese medicine, DaoDi is a term that lacks a perfect English translation. The word ‘Dao’ was originally used to describe districts in the Chinese empire, similar to the word ‘province’. The word ‘Di’ relates to soil, geography and landforms, so the concept loosely translates to geo or geo-authentic. What are the benefits of the DaoDi herbs? The DaoDi concept is beneficial for practitioners, patients and suppliers as it gives them confidence that they are assured safety and efficacy of treatment. DaoDi herbs are highly sought after and many cheaper counterfeits have arisen to meet the increasing demand. However, some herbs are wrongly labelled as DaoDi herbs to fetch a higher price. Factors that contribute to DaoDi status are recognized as a combination of environmental factors (climate, soil, drainage, terrain), coupled with traditional cultivation and processing weather. Weather can affect the environmental factors and change terrain, resulting in recognized DaoDi regions to change for some herbs. Rapid modernization and the constant challenges of sustainability have led to new developments to preserve China’s natural resources. Good Agricultural Practices (GAP) is customized to specific crops used in Chinese herbal medicine, ensuring quality control and a traceable source. 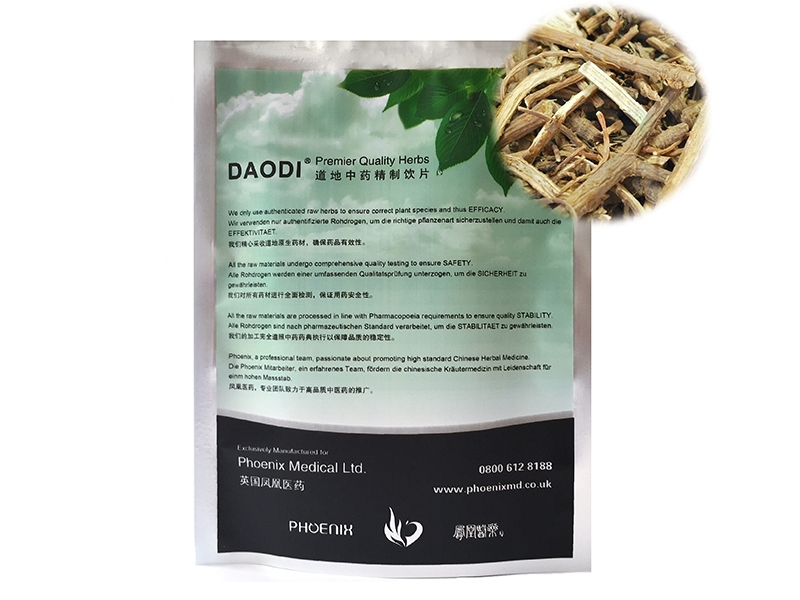 DaoDi herbs now account for about 80% of the Chinese herbs in trade and are known to be superior in quality, with many people believing DaoDi herbs provide better results. The concept dates back many centuries in China to herbal drugs that denote the ‘best quality’ and we are striving to continue that concept in 2018 within the UK and Europe. Unfortunately, some suppliers do sell counterfeit herbs that are wrongly labeled as DaoDi herbs. They are usually cheaper, not grown in the place of origin and can be the wrong species. By being sold inappropriate substitutes, practitioners are unknowingly using ‘fake’ products that have adverse outcomes, compared to authentic herbs. Herbs like Chai Hu and Ban Xia are commonly used herbs and recent years have seen their prices increasing but output decreasing resulting in counterfeit fakes circulating the TCM community. As the demand for herbs grew and supply decreased, prices were driven up and therefore gave rise to cheaper alternatives, of which were either the wrong species or treated with sulphur. 1. 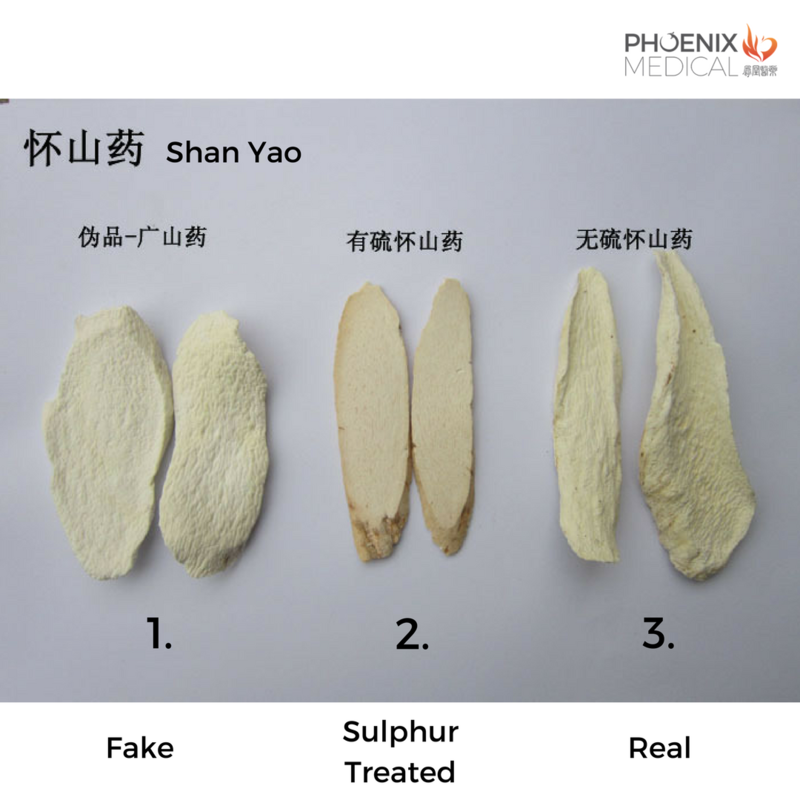 "Fake" herbs with similar appearances are distributed worldwide, even within China. Many practitioners are not taught how to distinguish herbs by looking at the appearance. Fake Shan Yao only has slight differences from the real Shan Yao, only distinguishable from the natural curling of the edges from dehydrating. The species of the two are completely different. 2. Sulphur is widely used to kill microbes, prolong shelf life and to improve the appearance of herbs. Sulphur also reacts with the chemical components of the herbs and can create unwanted and potentially harmful active ingredients. If you're using the smooth and white, then that has been sulphur treated and we urge you to stop prescribing it. 3. The Shan Yao on the right is authentic, not treated with sulphur and also not grown with pesticides or herbicides. At Phoenix, we ensure that all of our herbs are 100% authentic and grown according to the DaoDi principle; grown at the right place, harvested at the right time. We never use sulphur, pesticides or herbicides because these chemicals can alter the efficacy and treatment effects, putting patients at risk. We had helped Christine Leon at Kew Botanical Gardens develop her new book "Chinese Medicinal Plants, Herbal Drugs and Substitutes", and we highly recommend this book if you're a herbalist. The book goes into great detail in distinguishing the characteristics of Chinese medicinal herbs, viable substitutes and also the counterfeit imposters.